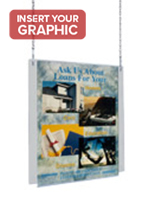 Do you need hanging poster frames to display promotional graphics and informative signs from the ceiling of your business? 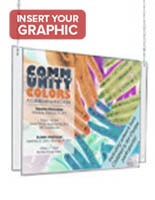 These acrylic sign holders are also great for other non-commercial settings, including churches, non-profit organizations, and schools. The hanging poster frame, or suspended picture framing, features clear plastic that keeps the viewer's attention directly focused on the displayed art print. This way, the overhead holders act as effective lines of communication between the business owner and the intended audience. The double-sided hanging poster frames are often seen used in retail storefronts because of their ability to draw in passing pedestrians from outside, but also relay important information to customers inside. Also, because the holders are designed using typical size measurements, it is easy for owners to create their own custom graphics to hang in the enclosures. What does the process of setting up the large or small plastic displays entail? 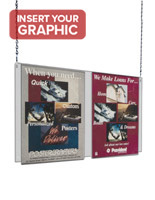 These hanging poster frames come with all of the necessary suspension hardware if they are the frameless acrylic displays. The small holders with red, black, and clear plastic edges are sold with hooks, but chain will need to be supplied by owners. The next part of the setup involves the jack chain, which is provided in (2) 60" lengths. Owners can choose to use the chains has they are, or cut them to change the height of the suspended framing. Pictures that will hang in store windows may be lower than those that will display large signs directly over people’s heads. Lastly, the S-hooks are slipped through the pre-made holes at the top of the double-sided acrylic framing or the clear plastic clips on the side of the wet-erase frames. The jack chain is attached to the ceiling hardware and is linked to the display. The fold over frames are also outfitted with pre-drilled holes at the bottom for the ability to daisy chain sign holders of varying size. These mounts are used in many different settings to present all sorts of signs. 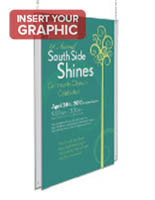 The hanging poster displays are definitely mainstays in entryways, especially at financial establishments, real estate agencies, and restaurants. 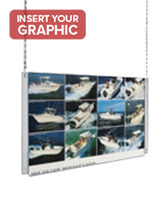 Using ceiling picture holders makes it easy to hang large graphics or advertisements in the plastic frames to really draw customers’ attention. In other cases, the hangers are used to showcase vital details about emergencies, like evacuation plans or safety procedure signs. 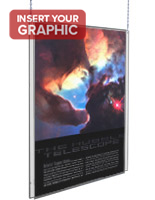 The hanging poster display is perfect for exhibiting building layouts and directions in large complexes. 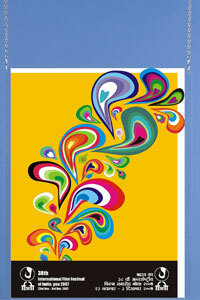 This framing can also house art prints hung from ceilings in galleries or photography studios.